MapleStory fans rejoice! A “pocket” version is available for Android and iOS platforms and trust me it’s as engaging and immersive as the original one. 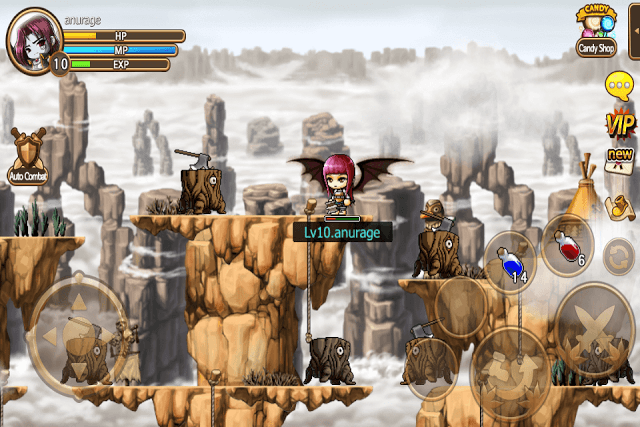 There are plenty of monsters to battle, quests to complete, rewards to win and items to craft. There are several benefits of leveling up your hero. You receive stats, skill points and can use higher-level weapons (once you reach their level limit). You will need EXP to fill your character’s level meter. While completing quests is the best way to gain plenty of EXP points, another fun way is to fight low-level monsters at the very first location or a previously cleared location to gain EXP and level-up your hero faster. Reaching a new level will make it easier for you to fight monsters in previously cleared regions. Don’t forget to equip your hero with powerful weapons/armor/items, allocate stats to your hero’s attributes and skill points to an active or passive skill before fighting enemies. Each location has monsters roaming around in groups or solo on a platform. Scan the region and choose a platform or a cliff that has one or a maximum of two monsters. In Pocket MapleStory, your hero loses HP even if a monster touches him/her. If you are fighting with multiple enemies, chances of losing HP are higher. You may move your hero to a safe spot, in a corner, and then launch an attack when enemies move to the other direction or use powerful weapon/armor/kill to make sure monsters get defeated faster before they come closer to your hero. Another way is to scan and identify those platforms that have fewer monsters, climb to that area and rapidly press the attack button or use “Auto Combat” to take them out faster. Enemies will respawn in a few seconds at the same place, so wait in a corner and launch attack as soon as you see a monster appear. Tap on “Candy Shop” and then press the capsule machine tab. There’s a weapon capsule, an armor capsule and an accessory capsule. You will see a list of probable items under each capsule. A regular capsule set costs mesos whereas premium capsules requires premium coupons, which you can get if you complete special quests, become a VIP or via the daily rewards option. 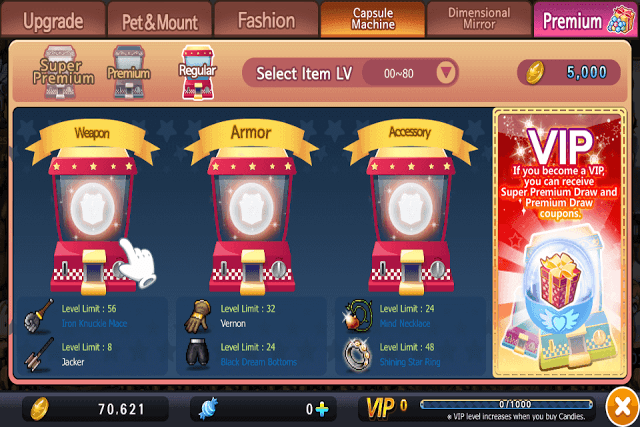 Before tapping on a capsule, select “Item LV” to choose the level of the random item. You can receive potions from “Consumables”. Search for an old man with “Consumables” label above him in the “Perion” region. Similarly search for an NPC with the “Equipment” label in the same region to buy weapons and armor. Use your map to locate such NPCs. You can buy both potions and weapons using mesos. When buying a weapon or item from the equipment store, choose the one which has a blue up arrow beside “ATT”. Before embarking on a quest, make sure you equip your hero with the best weapons and armor. Tap on your hero’s profile pic located at the top-left corner of the screen. Select the “Equipment” tab and tap on a weapon, armor or accessory. Do not select those items that have a red “stop” symbol above them. Such items can be used once the character reaches their “level limit”. After tapping on a weapon armor or item, tap on “Slot” to equip your character with it. It will be automatically fitted to its respective slot. To remove an object from your hero’s equipped weapon/accessory list, tap on it and then tap on “Cancel”. You can get weapons or items by completing quests or via the “Capsule Machine”. The in-game map is divided into three parts: My Location, Path and World. My Location will show you a list of enemies if you are in the enemy’s lair or NPCs, shops and other key objects of interest if you are back home. Just tap on any name in “List” and that particular object, NPC or enemy will be seen flashing on the map screen. “My Location” can be very useful to identify the location of enemies. After accepting quests that task you to defeat 10 enemies of the same type or collect item drops from an enemy type, just teleport your character to that location, tap on Map located at the top-right corner of the screen, go to My Location and find enemy location by tapping on its name in “List”. You can find detailed information about a task under “Quest”, which is located by tapping on the book icon located beside the map icon. “Path” is another option to view enemy and NPC information and can be of immense help of identifying enemy types before accepting a quest. Use this before embarking on your adventure. For example: If a quest requires eliminating 10 Ghost stumps in “Gutsy Peak”, just tap on Map, go to Path, find Gusty Peak by tapping on each blue orb and view monster information. IMO, “My Location” offers a comprehensive list of monsters and information, so head to the main quest by using teleport and then go to My Location to get enemy information as well as its location. 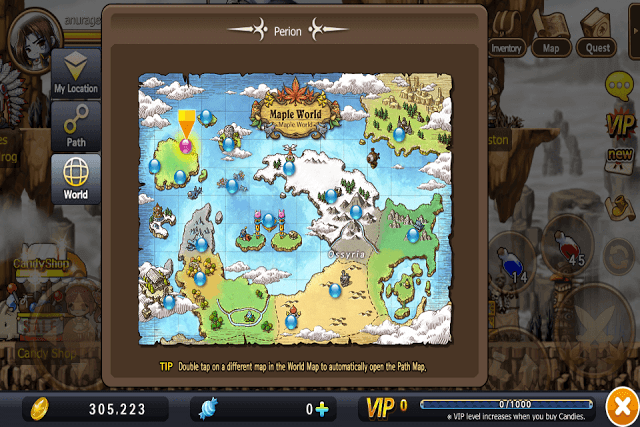 Under World, you will get to view the entire MapleStory world. Double-tapping on a region will take you to “Path” and will show all locations of that region. With a fat thumb, it may be difficult for you to control your character’s movement using the control pad. With one-touch controls, you just need to tap on a location and your character will move to that area, tap on an enemy and your hero will keep fighting until it gets eliminated. But in a one-touch control system, the AI will choose the path for your character, and the chosen path may do more harm than good to your character. Your hero may choose to walk through a group of enemies to reach the selected spot, whereas with a control pad, it’s you who will have complete control over your character’s movement and choose the best and the safest path. Select a familiar control system, the one that will make it easier for you to move your character and beat opponents. If you are using a tablet PC, then the control pad would be much easier to use than in a mobile phone. To switch to the one-touch control control system, tap on your hero’s profile pic at the top-left corner of the screen and go to “Option”. Under “Move by Touch”, select “ON”. 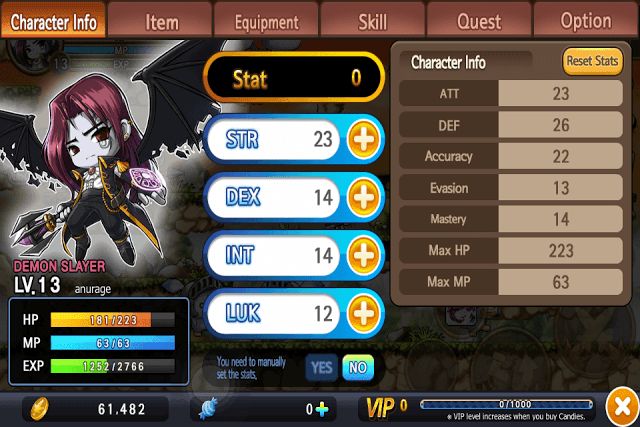 Stats appear on your character’s profile once you level-him up. You can then allocate stats to key attributes such as STR, DEX and INT. Allocating points to a attribute improves a set of abilities. For example: Adding stats to INT (Intelligence) will improve your character’s accuracy, mastery and Max MP. Allocating a point to STR will improve your hero’s Attack, Defense and Max HP. You can manually allocate stats to attributes by tapping on “No” located below the attribute list or “Yes” to let the AI add them for you. I prefer the former as it gives me complete freedom to choose which attributes I want to improve. 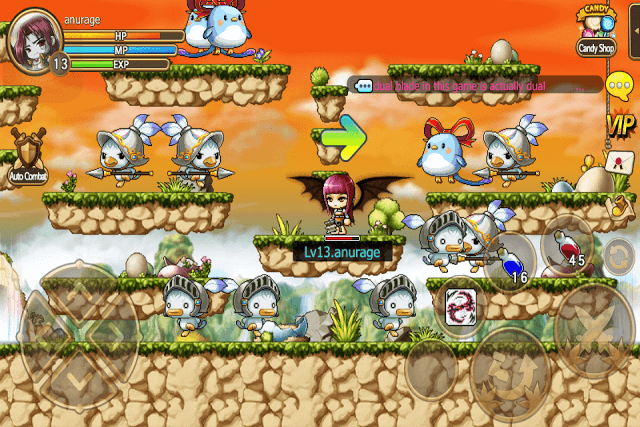 In Pocket MapleStory, skills play a key part in battle. 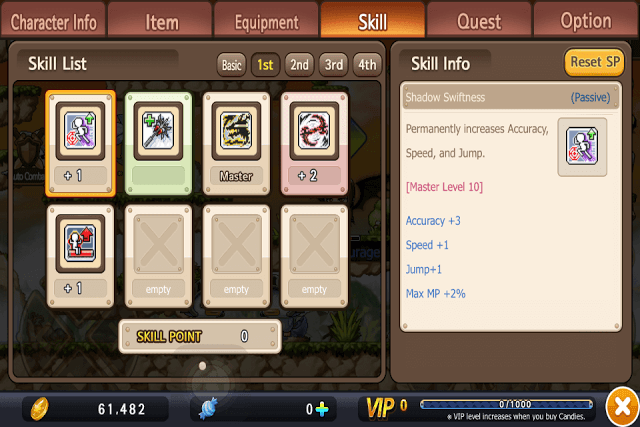 Some are passive in nature and require some action from a player to get triggered whereas others are active skills, which can be launched by tapping on the shortcut button. You will receive a skill point after leveling up a character (Reach level 10 to activate skill points). Before allocating a skill point, choose a skill that you think will benefit you in battle. Allocate points to passive skills to make them more powerful. You can unlock a new skill set by getting job advancement. NPCs will give you hints about your hero’s Job advancement, so keep an eye on dialogues exchanged between an NPC and your hero. At first, you will get 1 skill point with each level, but after second job advancement, you will start receiving 2 skill points per level. Add your active skill to the shortcut button if you want to launch it against an enemy. The shortcut buttons are located just beside the attack buttons. Mana potions and health potions have already been added to the shortcut button set. To add an active skill to shortcuts, go to your character’s profile > Skill, search for an active skill, and then tap on it. Next, tap on the “Shortcut” button. Active skills require mana potions, so whenever you use one, you will be using mana potions (MP). You may get both MP and HP potions via rewards to your inbox, as quest rewards and daily rewards. You can make your weapons and accessories stronger by infusing scrolls and miracle cubes into them. Go to your character profile page, press the “Equipment” tab. Tap on your weapon or item and then press upgrade. 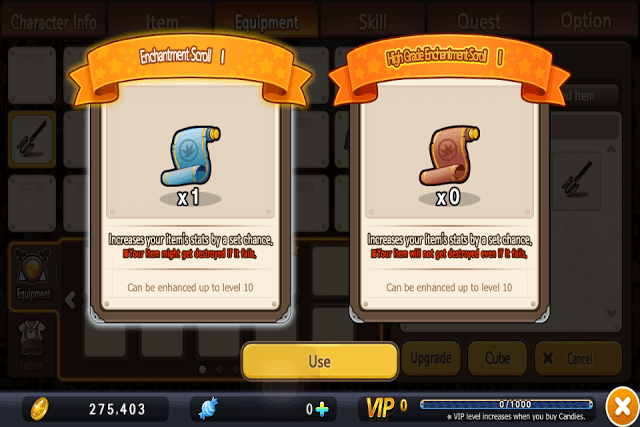 You can upgrade your weapon using common and high grade enchantment scrolls. You can also enhance your weapon using miracle cubes. A miracle cube adds a new attribute to your equipped weapon. Tap on a weapon or item and press “Cube” and then press “Use”. To receive an enchantment scroll or a miracle cube, complete quests (both main and side quests) and look for rewards on your inbox. Some quests may grant you these items. Use them wisely. Instead of wading through swarms of monsters (and reducing your character’s HP to zero) to reach the location of a quest, why not use “teleport”. Just tap on the tiny boot icon on the right side of the screen and select “Yes” to move your character to key locations automatically. Use teleport to move to your quest region or your home safely. You can also tap on the “Move Now” button shown on the quest screen to go to the location of a quest. 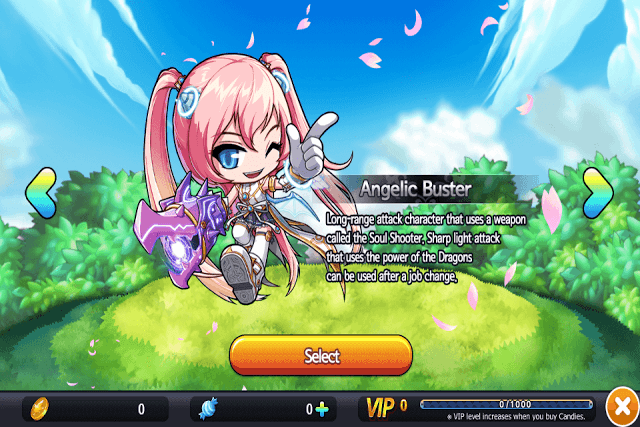 Don’t use teleport if you want to fight monsters on your way home or to key locations of a mission to earn some mesos/materials and level-up your character faster. There are 3 types of heroes: Demon Slayer, Dual Blade and Angelic Buster. Of these three, the first two heroes have skills that can inflict damage to multiple enemies. The third hero can inflict a long-range attack with her gun. Choose your hero according to your play style. You may even experiment with all three types by adding 3 different heroes on all 3 open slots and then choose the one that fits your battle style. Just tap “Create” to add a character to a slot, select a hero, enter a nickname and you are ready. Each new hero has a different story to tell and will encounter different types of enemies, although gameplay is quite similar. If you choose a new hero, you will have to start from scratch. Preserve your character’s HP. Don’t get attacked by enemies. Eliminate them before they come closer to you. Using Angelic Buster’s long-range weapon can be a great way to eliminate monsters from a distance. Use HP potions whenever your hero’s HP is below 50 percent. If your hero dies mid-battle, 10 percent of mesos will be deducted from the total meso amount. There will also be a 10 percent deduction in EXP, so expect the EXP meter to slide back a few points if your hero dies. You can move extra items to storage in case you want to free up space in your inventory. You will find “Storage” back home (or use Map to locate one). You can move items back to your inventory any time, but you will need to spend 2000 mesos to do so. The Crafting merchant lets you craft weapons, accessories and items. You must choose a sub-class or a profession before you can craft items. Sub-classes include Weapon blacksmith, Armor blacksmith, Alchemist and Accessory Craftsman. Choose your sub-class carefully. You can change your profession anytime, but you will have to pay mesos to do so. Once you have chosen a profession, you can craft new weapons with materials dropped by monsters or collected from quests. You may even fuse unwanted weapons (or armor/accessory) to create a new and powerful item.